See more objects with the tag domestic interiors, New York City, night, curtain, furnishing fabric, lights. This is a Sample. It was designed by Alexander Hayden Girard and produced by Herman Miller Textiles. It is dated 1958 and we acquired it in 1969. Its medium is 40% cotton, 15% rayon, 45% mohair and its technique is screen printed with discharged on plain weave. It is a part of the Textiles department. Alexander Girard produced over three hundred textile designs during his almost thirty-year tenure at Herman Miller, an important American furniture company and promoter of modern design. That Girard was trained as an architect should come as no surprise - like many architects of his generation, he had experienced firsthand the challenge of finding textiles appropriate for a modern interior. As director of Herman Miller’s Textile Division, Gerard sought to create a fabric collection that would conform to his architectural training, combining pure forms like circles, triangles, and squares in appealing configurations. This piece is composed of white rectangles arranged in grid-like patterns against a black ground, suggesting a nighttime view of the Manhattan skyline. 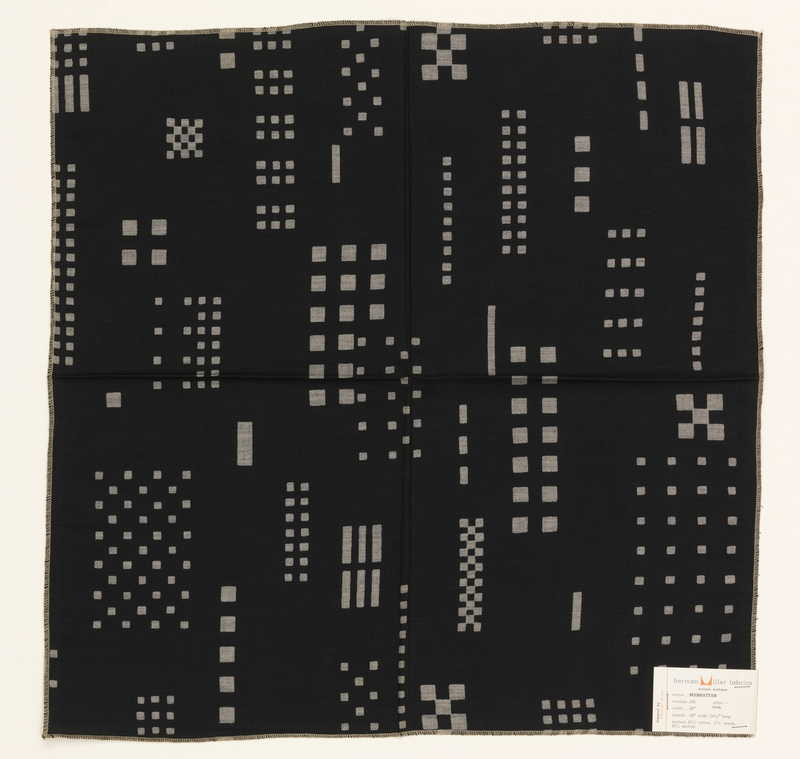 The Museum also houses the design for this textile (1969-165-268), produced as a blueprint like those used by architects and engineers. Herman Miller Fabrics paper label attached to lower right corner.